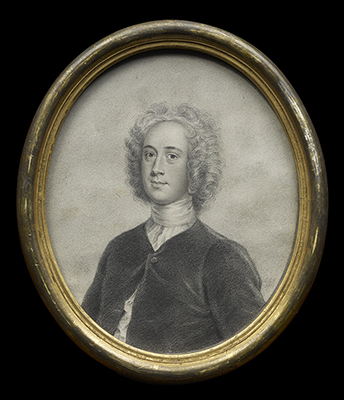 This impressive yet delicate pencil drawing of William Somerville by John Smart Junior is taken from a full-length portrait thought to have been painted by William Aikman, the well-known Scottish portrait painter, in the mid-1720s. William Somerville was an English gentleman interested in poetry and fond of hunting. Somerville was born in Colwich in Staffordshire to Robert and Elizabeth Somerville of Edstone in 1675 and was educated at both Winchester College and then New College, Oxford. In 1696 he became interested in pursuing the law and entered into Middle Temple, one of the four Inns of Court in London, however, by 1705 his father had died and he returned to Edstone in Warwickshire to look after the family estate. Somerville married Mary, daughter of Hugh Bethell of Rise, Yorkshire, in 1708 and although they had a happy relationship, Mary died childless in September 1731. The Somervilles were renowned for being a sociable and amiable couple, with William enjoying several sporting activities, particularly hunting, for which he owned several pairs of otter-hounds and fox-hounds and horse racing with his favourite horse Old Ball. Somerville is best known for his book The Chase, dedicated to Frederick, Prince of Wales, it is a poem written in blank verse over four books which literarily demonstrates the excitement of the sporting pursuit. This book was followed by Hobbinol, dedicated to William Hogarth in 1740, another sporting poem, this time on the subject of the Cotswold Olimpick Games, a yearly event which commenced in 1612 and is still held at Chipping Camden in the Cotswolds. Somerville then published a less successful book, Field Sports, a poem on hawking in 1742. Although his literary career did not provide Somerville with fame or fortune, his writing did catch the attention of Allan Ramsay, the Scottish poet, who became a great enthusiast for Somerville’s work and a close friend. As Somerville got older, the costs of his Edstone estate and his passion for hunting took their toll on his finances and having to pay his widowed mother £600 a year until her death at the age of 98 (dying just one month before Somerville himself), he got himself into heavy debts. To rectify this situation he asked a member of the Scottish branch of the Somerville family, James 13th Lord Somerville if he would purchase his debt on the promise that he would bequeath his entire estate to him on his death, James agreed and inherited Somerville’s estate in 1742, including the portrait of William Somerville by William Aikman. It is possible that John Smart Junior saw Aikman’s portrait whilst it was being exhibited at a London location or at the Somerville estate in Edstone, which was owned by John Southey Somerville, 15th Lord Somerville in 1801. John Smart Junior was the son of the great eighteenth century miniaturist, John Smart Senior. Smart Junior and his siblings were left at home whilst their father travelled to India in 1784 and it was not until 1808, following his education with the miniaturist Robert Bowyer, that Smart was sent for by his father to join him in Madras to train further. Both father and son were interested in copying the works of Old Masters, common practice, particularly when training as an artist, and there are several drawings by John Smart Junior after Hans Holbein, formerly part of Daphne Foskett’s collection. Although the style of father and son’s miniatures is certainly similar, John Smart Junior preferred to work on paper and card rather than ivory and, at the time this miniature was drawn, he was exhibiting miniatures at the Royal Academy of Arts. John Smart Junior arrived in Madras in February of 1809 and although he may have produced several miniatures during his stay, only one example survives; tragically he died only four months into his visit from unknown circumstances. His father died two years later. Several of John Smart Junior’s works exist in public collections including the Victoria and Albert Museum and previously the Wellesley Collection and have been exhibited throughout Europe.